One of the most useful structures in my garden are bamboo tepees. They are the perfect vertical garden solution for growing more in less space. Here’s my simple system for making a 3 or 4 legged tepee from bamboo stakes in about a minute for around a $1! I have countless tepees in my garden growing seasonal edible climbing crops. 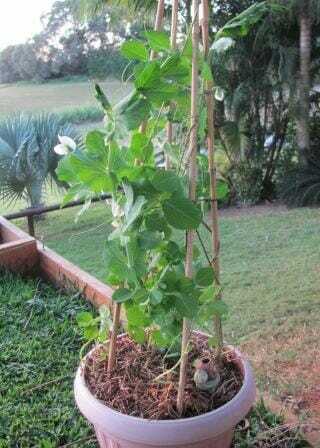 These snow peas are flowering and fruiting and their tendrils love the vertical stakes to grab hold of. Bamboo is a renewable resource, so it’s a sustainable choice. It grows easily in our sub-tropical region, so many people have access to their own backyard supply. Even if you have to buy a few bamboo stakes, they are low-cost and good value. Bamboo is long lasting, flexible, attractive, multi-purpose, takes up minimal space and is lightweight. So needless to say, it is a material I love using in my garden. When giving garden lessons to groups of school students, I had to teach them a system to make tepees fast but one that would still last the distance! I developed this quick, easy, cheap and fun way to make your own tepee. It’s a practical way to grow climbers like beans, peas, tomatoes, cucumbers and eggplants in a compact space. For vigorous climbers you can use longer, thicker lengths of bamboo with more strength. 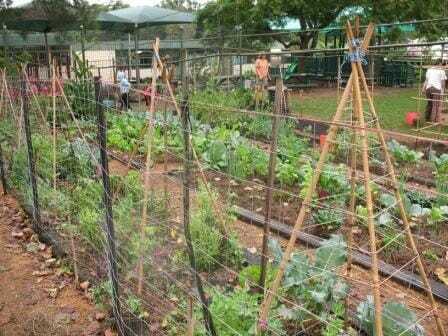 They can be made into a wide variety of structures but here they are used by our local school gardens after the students had fun making them one morning. Check out the horizontal string lines used at intervals up the structure for additional support. You will need a strong rubber band, a piece of string or baling twine (about 40cm long), a pair of scissors and your bamboo stakes. 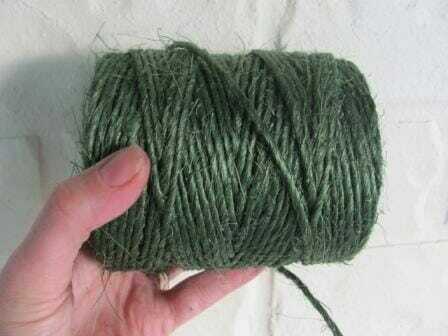 I like using twine that has some grip like the roll below so that the tie doesn’t slip as you wind and stays in place for the life of the tepee. 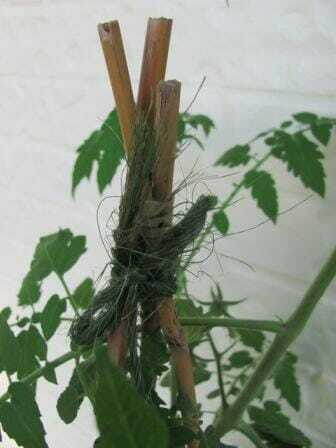 I like using green lashing twine or string as it is camouflaged by the plants as they grow! It’s most economical to buy a roll if you think you’ll make a few tepees and is very useful in the garden in general. How many stakes do you need? 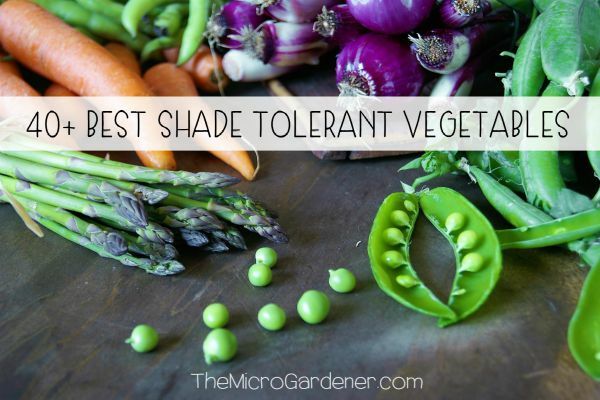 The number of stakes you require depends on the shape of the garden bed or pot you are using. If you are putting the tepee in a rectangular/square container or in a garden bed, 4 stakes is usually a good stable number to use. In a round pot, try 3 stakes as these sit in a circle much better than 4. This school garden four stake tepee is made from thicker tall bamboo for stability and the posts are embedded in the soil. To save money, baling twine from mulch bales is reused for horizontal supports. How high? The height of the stakes depends on the variety of climbing crop you choose to grow. I have both short and tall tepees to suit a variety of crops. 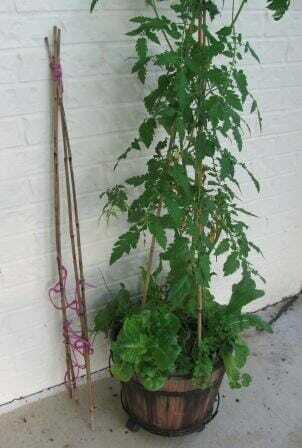 I’ve also found that indeterminate tomatoes and cucumbers do well on taller tepees. If you’re lucky enough to grow your own bamboo, you can cut and trim your own stakes. A small hacksaw is all you need. Otherwise ready made bamboo stakes (or canes) are available at hardware, garden and horticultural supply stores or online. I buy mine in a bulk pack of 50 either in a 900mm or 1200mm length. Grab the top of all the stakes together in one hand, so the ends of the stakes are level with each other. With your other hand secure the rubber band around the top of all the stakes about 5cm (2 inches) from the top to hold them all together. Now I said this takes a minute – we’re not done yet! 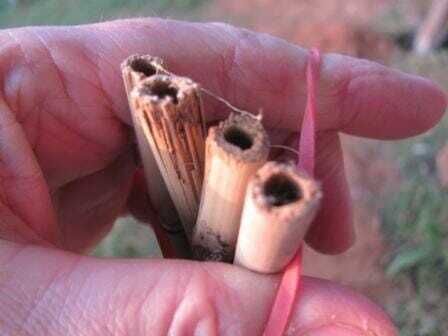 Make sure the top of all the stakes are level before securing a strong rubber band around them. Usually twice around will do. This leaves both your hands free to wind the twine around the stakes. The rubber band won’t stand up to the sun for long, so you need to thread the string just below the rubber band over AND under each of the 3 or 4 stakes until they are well secured to each other. This should take about 45 seconds! 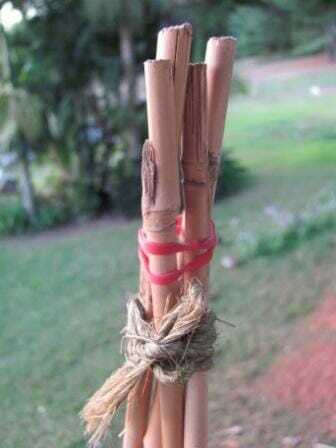 Wind the twine in and around each of the stakes (front and back) making sure you keep a firm grip. Then just tie a double bow around the outside and you’re done! You can now pull off the rubber band and re-use it. Easy as that! Once you have completed winding the string, tie it off in a bow and remove the rubber band. Spread the stakes out to secure them into the soil in your garden or pot, pushing them well down so they stay put! 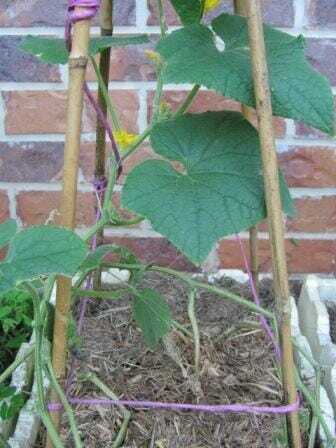 In this polystyrene micro garden, the four stakes are firmly secured deep into the potting mix in each corner and then the cucumber was planted near one stake to get started. For additional support, I like to wind some extra string around each of the 3 or 4 stakes at three different horizontal levels. At about 10-20cm (4-8 in) from the bottom, 40cm (16 in) from the bottom and then again about 15cm (6 in) above that again. Depending on the height of the stakes, you can just divide it roughly into thirds and add your strings there. This indeterminate cherry tomato needed lots of personal space and as it grew, benefited from horizontal string supports. 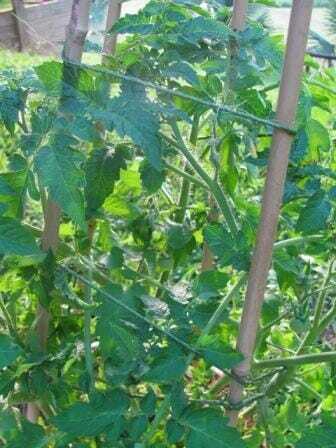 Tomato plants get heavy with fruit and stems can snap if not supported so it’s important the tepee has string tied horizontally and diagonally for best results. As the climbing beans (or other crop) grows, they can be trained or threaded through the string between the stakes and given support. As they reach the top, additional string can be used to tie them off. Tomato shoots reaching the top of my tepee are tied off loosely with string so the stems and leaves are not damaged and have enough space to keep growing. 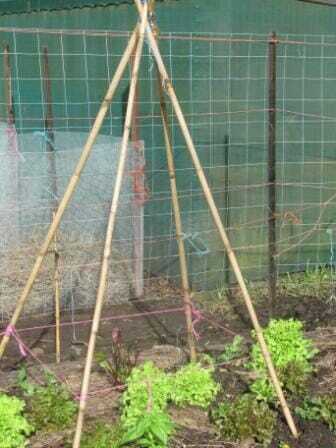 The tepee structure provides good air circulation around the plant which helps prevent diseases. 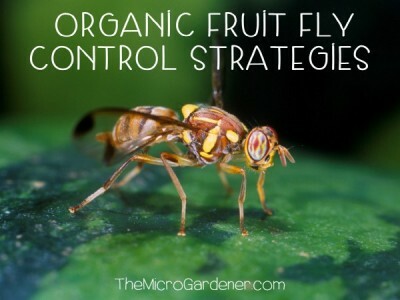 By keeping the stems, leaves and fruit up off the soil or mulch, they are also less likely to be accessible to pests. Horizontal and diagonal string supports help make the most of otherwise unusable ‘air space’ in the centre of the tepee. This also helps aeration and provides maximum plant support. You can easily cover your tepee with shade cloth or netting to protect your plants from weather extremes. 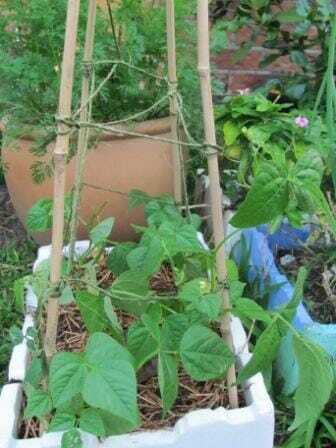 Once you’ve finished growing beans or peas on your tepee, re-use it for other edible climbers like tomatoes or cucumbers. For soil and plant health, I recommend practicing crop rotation. As legumes like beans and peas leave a lot of nitrogen in the soil, it’s great to follow them with a flowering crop. e.g. tomatoes, capsicum, cucumbers and eggplant which are heavy feeders. When you are not using the tepee, collapse it down. Fold all the stakes in tight together and wrap a rubber band around them. They take up virtually no space to store and are ready to go when you need them for the next crop! 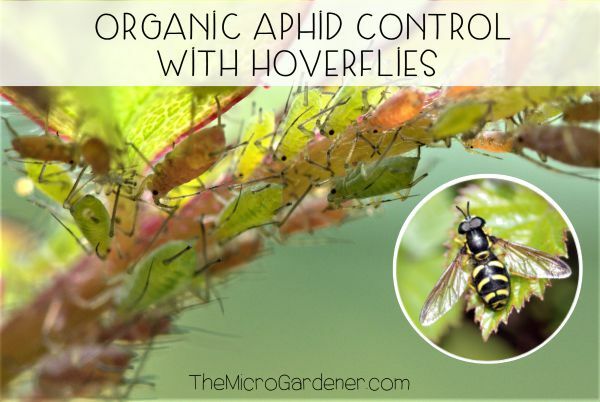 They are also an easy, fun project for kids to get started in the garden. Here is one of my mobile salad gardens on castors filled to the brim with lettuce, herbs and salad greens at the bottom and a healthy cherry tomato winding its way up a tepee to maximise vertical space above the pot. An unused bamboo tepee has been collapsed down for storage. 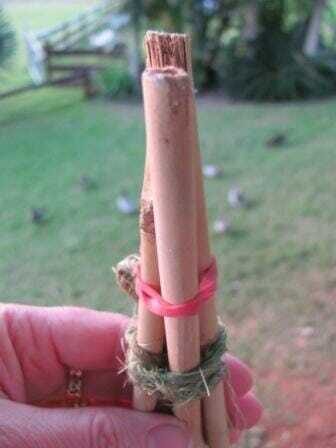 Bamboo stakes make wonderful tools in the garden for adults and children. Try using them as plant supports, giant rulers for measuring and dibbing sticks for sowing seeds and making shallow trenches. There are two ways to make a measuring stick from a bamboo stake: Before making the tepee, get a permanent marker and measure out 5cm (2 in) spacing along one side of one of the stakes. Add marks for the centimetres/inches in between just like a giant ruler if you wish. When positioning the tepee in the garden, make sure this faces outward so the markings are visible. As the bean plant matures, children can practice their maths, reading and writing skills by keeping a daily journal of how high it grows. This also provides tangible evidence that change is taking place day by day and helps them keep an interest. The can see how tall their ‘beanstalk‘ is growing and when it stops! They can also record how many beans or peas each plant produces, how long they are and also save seeds from the best ones (make sure you choose heirloom seed varieties to do this). I usually mark the entire length of a 900mm ruler to use in the garden for plant spacing and measuring. You can use as a dibbing stick by poking it into the soil and dropping in larger seeds to the correct depth. Lie it flat and wriggle it into the soil to form a shallow trench for sowing small seeds like carrots. Alternatively, you can make a giant bamboo ruler out of a single stake that is not part of a tepee. 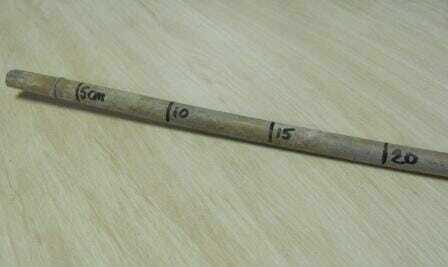 This can be used to help with plant spacing and other measuring tasks. It is a super easy tool to use to help sow plants or seeds the right distance apart. You just lay it on the soil and plant beside it. 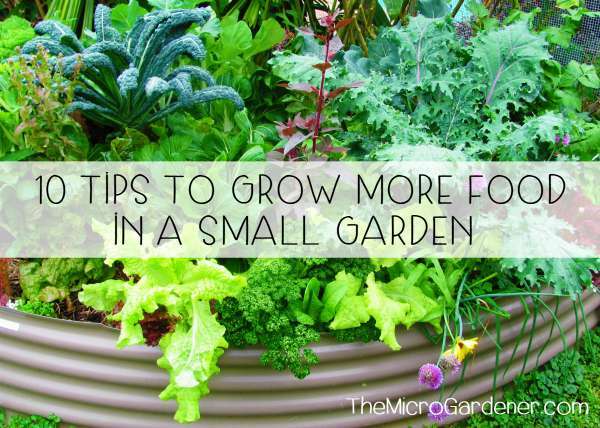 Stick it in the soil vertically when not in use or keep in your potting shed. Want some more low cost garden ideas? You’ll find plenty in Tips & Tricks, Frugal Gardening and some simple projects for children in Gardens for Kids. Did you find this information helpful? Feel free to leave a comment below. Do you put one or 2 diagonal pieces of string? Usually 2 pieces of string on the diagonal so the pea tendrils have more surfaces to grab onto. Good luck! Very cool. My mum made me and my siblings something like this but with peas when we were young, but it was big enough to sit inside of. We loved sitting in it and picking the peas. Thank you for this, my son has bamboo in his yard, and is bringing me some sticks for my garden. Lucky you Helen! A cheap, sustainable resource you will find invaluable. Merci, pour vos idées de tipi chez nous le bambou pousse bien et vos idées vont nous servir d’année en année !! Mon plaisir Annick – si content que vous avez trouvé cela utile. Jardinage heureux! Love this idea. I found nice long bamboo stalks at my local dollar store! I am going to try this idea with a climbing vine for my flower garden! Thanks! Thanks Andrea! These tepees are so quick and easy to make – I just LOVE them as a project! 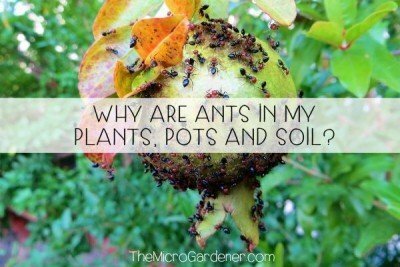 I have loads in my gardens. Hope yours is growing well. I’ll make some of those for my mothers broccoli boxes.